Kurinji Flower, which blooms once in 12 years, is a bright blue-bell shaped flower found on the hill slopes of Western Ghats in South India. The flower is also associated with Hindu God Muruga – son Shiva and Parvati. He is worshipped as Kurinji Andavar – at a temple in Kodaikanal in Tamil Nadu. The neelakurinji flowers last bloomed in 2006 and will bloom in 2018 again in the Western Ghats especially in Munnar (Kerala), Nilgri Hills, Udhagamandalam (Ooty) and Kodaikannal region (Tamil Nadu). The Kurinji season is from August 2018 and October 2018. Muruga, who is known as Kartik, Skanda, Subramanian, Kartikeya, is the Deva Senapati or the commander in chief of Devas – the demigods. Murugan is widely worshipped in South India especially in Tamil Nadu, Kerala and parts of Karnataka and Andhra Pradesh. Temples dedicated to Kartik is also located in Malayasia, Singapore, South Africa, Sri Lanka, Australia and in many other countries around the world. It is believed that when Murugan married Valli, a tribal girl, he wore a kurinji garland. Murugan in South India is associated with hills and it is only natural for him to be associated with this wonderful natural phenomenon. All the important shrines dedicated to Muruga are located atop a hill. The Palani Hills, the main temple of Muruga is located here, also witnesses the mass flowering of neelakurinji. 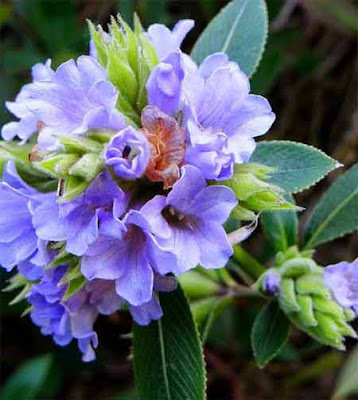 Kurinji Plant belongs to the genus Strobilanthes. The genus has around 250 species of which nearly 50 are found in India. The one that appears in Tamil Nadu and Kerala is blue and golden in color. Ancient Tamil Sangam literature like Ahananuru, Maduraikkanchi and Kurinjipattu used the kurinji flower and the associated mountainous landscape where it blooms as a symbol for the union of lovers. The Paliyan tribal people calculate their age, based on the blooming of the Kurinji flowers. The mass flowering and subsequent death of the kurinji is the subject of hill folklore. Some perennials flower only once in their lifetime, set seeds and die. The next generation of the plants is established from these seeds and the cycle is repeated. This happens in the case of Kurinjis. The time taken to mature varies in different species of Kurinjis. So different species of Kurinjis have different intervals of flowering. 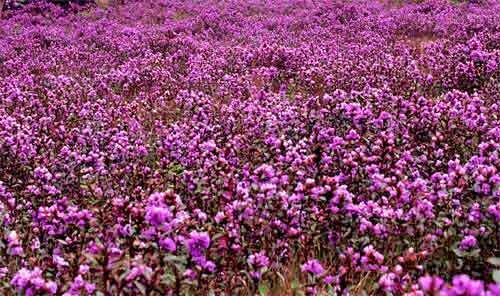 Neelakurinji matures in 12 years time and flowers gregariously every 12 years. The 12 years is known as a Vyazhavattom in Kerala and other regions. The flower depicts blue and golden color and therefore it is also associated with Guru and Krishna – Blue is the color associated with Krishna and golden color with Guru or Brihaspati.